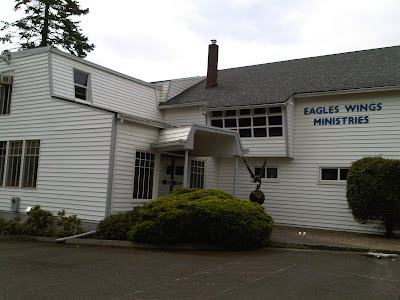 I am almost at the end of my three week visit to Portland, Oregon and my stay at the Eagle Wings Ministries Church. It has been a wonderful time of receiving and giving ministry. My favourite thing was getting to know more of God's lovely people. Eagles Wings sees itself as a 'base camp' for the Apostolic Reformation. A place of training and sending out. It has a small congregation but a big heart and a wide influence with many people all over the world benefiting from its ministry. The church is a five fold ministry church, i.e. one that believes in modern day Apostles, Prophets, Evangelists, Pastors and Teachers. They see these roles as the functions who govern and equip churches so that the saints can do the work of the ministry. Study of scripture shows that there a several apostles in addition to the original 12, one being Paul himself. There are also Prophets mentioned in the early church. The reforming move emphasises the need to go back to the biblical pattern for church life instead of an evolved model designed by man not God. The Apostle at Eagle Wings is, Richard Wright. He has served over 30 years in the ministry in different states of America. His books, Not Many Fathers and Not Many Sons are definitely worth reading. The church has ordained and sent out many into five fold ministry including my good friend and mentor Apostle André Pelser. Once a year they hold a 'Gathering of Eagles' which is a get together of five fold ministers from around the globe. This year I shared accommodation with Faustin from Zambia and John from Canada. We were the international section. Others came from all over the states. New friendships were made and old acquaintances renewed. I gained a lot from my first Gathering and would like to attend future ones. Highlight of my time here was the wedding of Apostle Richard to Cheryl Schank. I acted as chaperone for the first week leading to their wedding. To see how an American wedding is organised was insightful and educational. The ceremony was beautiful with all the five fold ministers praying and prophesying to the couple as part of the ceremony. After that a hog roast and Hawaiian themed picnic. A great time. I ministered on the Sunday after the wedding. I really love preaching in places where they know how to receive a prophet. During the worship I received prophetic words for several which later I was told were spot on. If I was way off I am sure they would also have made that known. The Lord gave me a word about endurance which I was told was timely. Final week was about being spoilt. I have been utterly served and looked after. A great testament to the people here. I have been taken on historical tours, invited for meals, taken river fishing and pond fishing, and been made to feel part of the family. It has been a great blessing. We are planning to host Apostle Richard and his new wife next spring. Look out for meetings we plan with them, they will be excellent. They have years of material on their website www.eaglesaint.net which are invaluable resources. Why not take a look? My time is about to come to an end here, back home Monday arriving Tuesday. I shall miss the people. I plan to come for a holiday next summer with my wife and expose her to this wonderful church and beautiful part of America. Thanks Eagles Wings, you are so special. I'm amazed to have stumbled upon your blog. I would love to keep in touch with you. I also have a blog.